Fall is coming here!! It is! Kids are going back to school, the leaves are getting ready to change colors, or I suppose at this point they are about done changing colors depending where you live, and we’re back to my fave time of year. I love it. Fall is my most favorite time of year and I can’t get enough of the cool, crisp air! 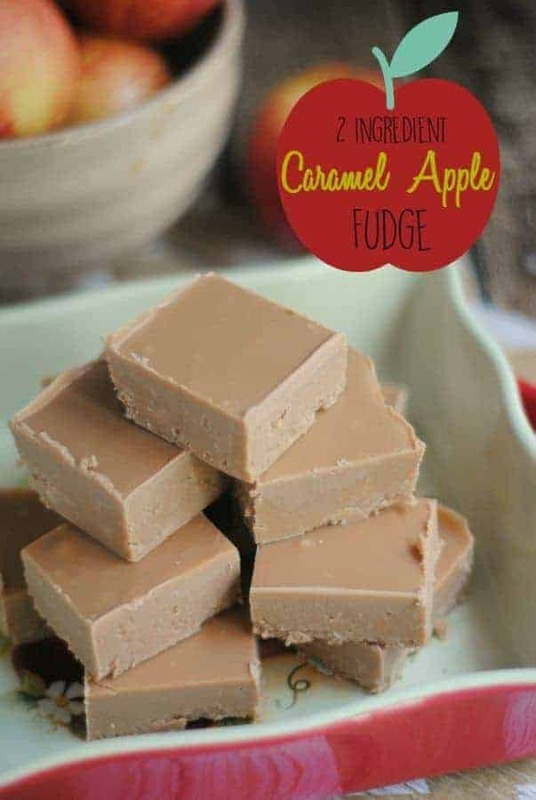 I also love simple, easy recipes that come together in little to no time to surprise the family (or neighbors) with- this caramel apple fudge recipe is just 2 easy ingredients, and a whole lot of yum. Simple is my favorite thing when it comes to cooking lately. With the chaos that comes from having 3 children all involved in various activities and sports, time is a premium and sometimes, there just isn’t a lot of TIME for us to sit and bake or make more time consuming recipes. #1. 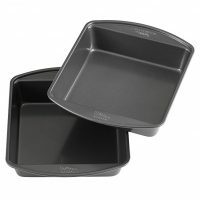 Spray an 8×8 baking dish with non-stick cooking spray. #2. Scoop the Caramel Apple frosting into a medium size microwave safe dish. Add in the candy melts. Don’t use a metal spoon to stir, I like using a simple rubber spatula when making any fudge recipes. It’s just easier for me and you don’t miss out on any bits of fudge sticking to the bowl, much to the disappointment of my children. #3. Place the dish in the microwave and heat in 30 second increments, stirring every 30 seconds until melted – my microwave took about 2 minutes to completely melt the mixture. #4. Pour the fudge into the baking dish. #5. Place in the fridge for at least 1 hour to set. #6. Remove from the fridge and cut into squares. Want more easy dessert recipes? 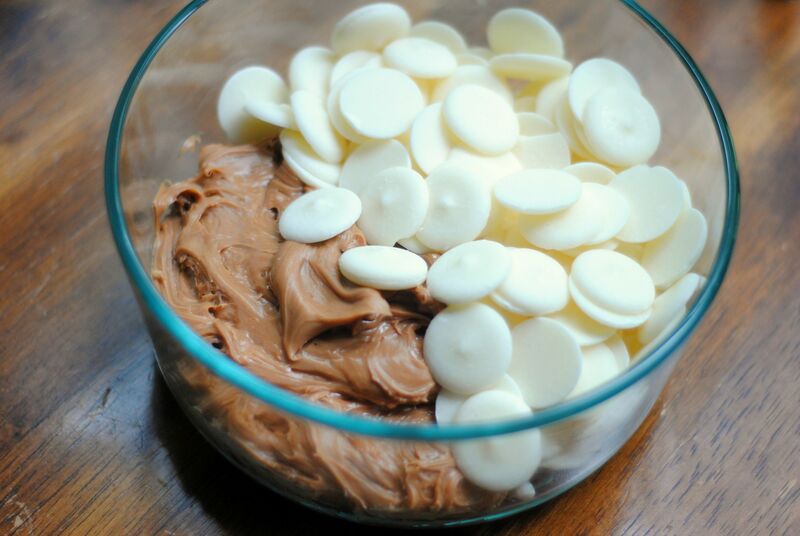 Have you tried our 2 ingredient chocolate fluff? It’s one of the easiest dessert recipes! You may also want to try our salty chocolate chip cookies as well. Scoop the Caramel Apple frosting into a medium size microwave safe dish. Add in the candy melts. 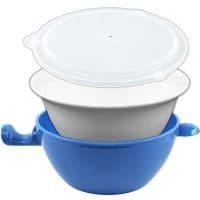 Place the dish in the microwave and heat in 30 second increments, stirring every 30 seconds until melted – my microwave took about 2 minutes to completely melt the mixture. Pour the fudge into the baking dish. Place in the fridge for at least 1 hour to set. ﻿Remove from the fridge and cut into squares. That sounds so delicious! I am definitely going to be looking for that frosting so we can try making this. Pinned. Can’t find the frosting at any of the store’s. This sounds so easy and delicious! Pinned to try this fall. What? This sounds amazing. Thanks for sharing. Happy Wednesday. Yum! 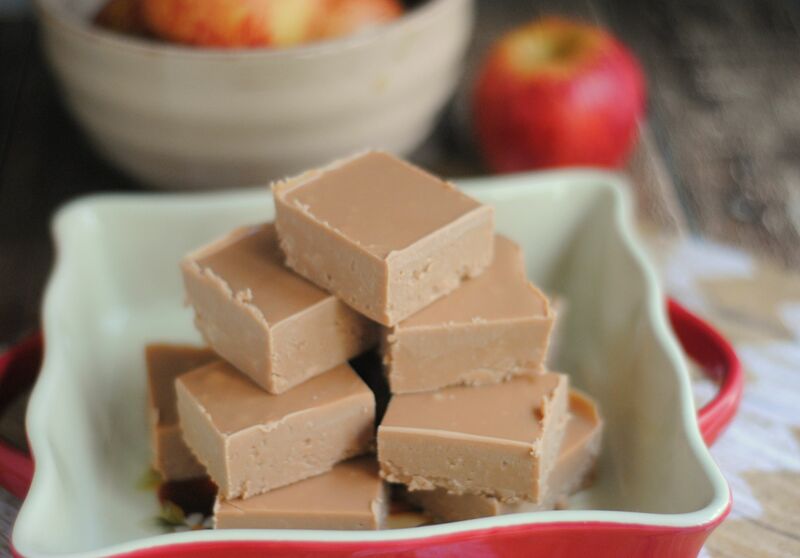 This fudge looks SOOO good! Thanks so much for sharing your yummy recipe on the Monday Funday Party! Oh my goodness gracious!! This caught my eye immediately and it is definitely a must try this fall! I’ve looked everywhere and can’t find caramel apple frosting 🙁 Where did you find it? Hey! Could you use different flavors of frosting? I didn’t know they made a caramel apple frosting. 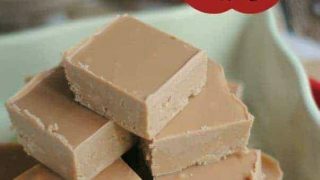 I will have to look for it because this fudge looks super yummy. I also love how easy this is.